I’m a rocker-chick at heart… For a long time, my wardrobe was almost entirely an homage to the Hamburg-era Beatles, and the early years of the Ramones. Although my tastes have broadened since then , I still tend towards clean lines and dark colors. Who am I kidding… it’s black. I wear a lot of black. Which is great if you’re a fashionista, but not so great if you’re a knitter. It’s hard to knit with dark colors, and equally, dark colored knits are hard to show off. What’s the point of all that fancy patternwork if no-one can actually see it? 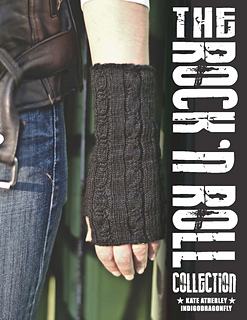 These four pieces are designed specifically for knitting in dark colors… they’re interesting, but still easy to knit. They are detailed, but not so much so that you’ll damage your eyesight. The patterning is clean and strong. And the resulting pieces are beautiful and wearable, with an edge. They’re a little off-kilter – a little rock and roll. The socks and mitts each have a left and right. The shawl is slightly asymmetrical, and the hat features an irregular ribbing that is much more fun to make than a regular watchcap. And the yarns are rock and roll, too. Indigodragonfly’s fantastic shaded blacks from their “High Fidelity” series provide an excellent palette. Love color? Sure, you can do that too. Heck, you’d actually be able to show them off that way.